Today I have a very limited edition/single batch polish for you, Chaos and Crocodiles LH06. This is a gorgeous lavender linear holo. I got this cos it matches my lavender hair :D Quality is excellent and two easy coats was enough for an opaque result. Totally gorgeous!! I bought my bottle from Mei Mei’s Signatures but it’s sold out there. It later arrived to Norway Nails and as I hit the publish button it’s still available there. 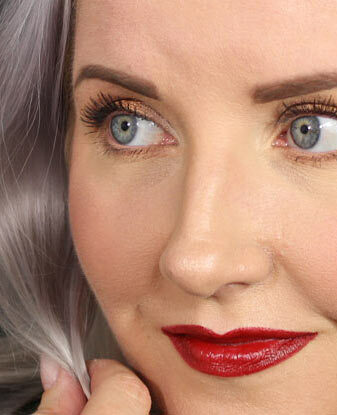 Use the code POLISHAHOLIC for -10% off. As I mentioned this is a single batch polish and if you want it I suggest you don’t think about it too long, once it’s gone it’s gone forever! 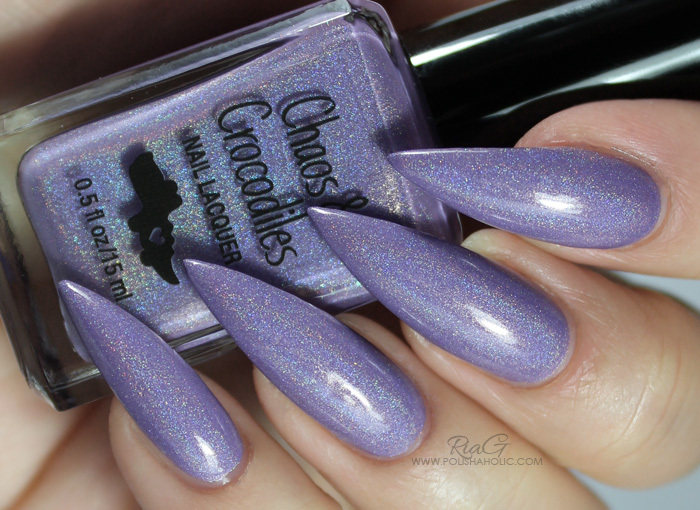 This is two coats of Chaos and Crocodiles LH06 with HK Girl top coat. ***LH06 was purchased by me. HK Girl was gifted to me. I don’t benefit from clicking any of the links on this post or use of the discount code. 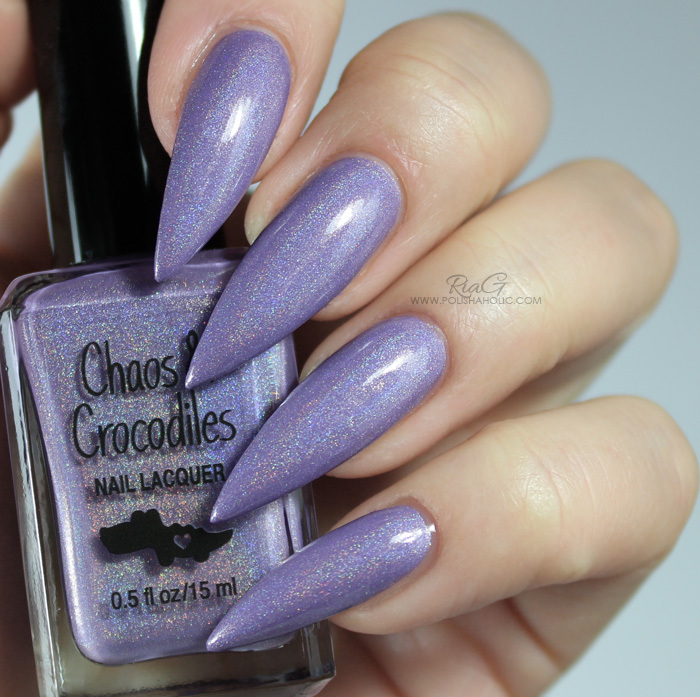 This is my first Chaos and Crocodiles polish and I was so excited when this brand became available internationally. 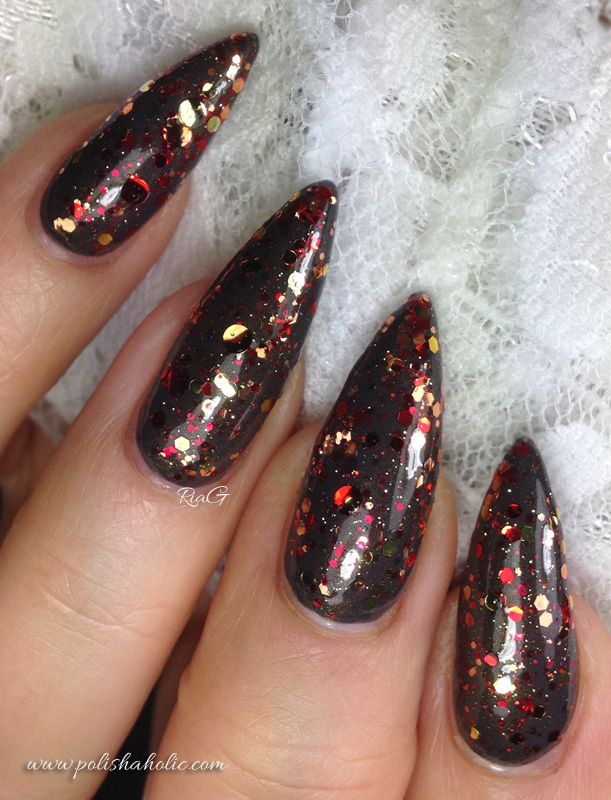 This one is Fireside Nights and it’s just perfection for fall with all the fire-y red and gold glitter. I layered two coats of Fireside Nights over IsaDora Loden Green and topped it off with a coat of G & G HK Girl top coat. Formula was nice and thin and the glitter came out of the bottle very easily. Two coats applied evenly and it was easy to control the amount of the glitter you were taking out of the bottle. The result was smooth enough that there was no need to use Glitter Food before the top coat. ***All products used on this manicure were purchased by me. I don’t benefit from clicking any of the links on this post or use of the discount code in any way.